Last month, anonymous assailants bombed a sub-sea pipeline to Shell’s Forcados export terminal in Nigeria. The terminal may not be running until May at least, according to officials cited by RBC Capital Markets. The highly sophisticated attack closed off 250,000 barrels of oil exports per day and sharply reduced gas supplies to local power plants. Although the identity of the assailants remains unknown, security experts suspect that the attack was carried out by militants who deployed deep-water divers, according to the FT . Notably, this attack is not an isolated incident, reflecting the deteriorating political and security dynamics in Nigeria that pose an immediate threat to its oil output. “This is part of the significant increase in pipeline attacks following the government’s decision last month to issue arrest warrants for more than a dozen former members of the Movement for the Emancipation of the Niger Delta (MEND), including the ex-leader Government Ekpemupolo (aka Tompolo),” wrote Helima Croft, RBC Capital Markets’ head of global commodity strategy, in a recent note to clients. Back in the 2000s, armed militants in Nigeria’s oil-rich Niger Delta, including MEND, routinely kept hundreds of thousands of barrels of oil off the market. 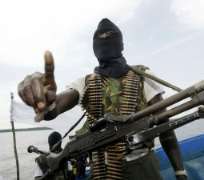 At the height of its activity, MEND slashed Nigeria’s oil output by 50%, cost the government $19 million in daily defense outlays, and claimed an estimated 1,000 lives per year, according to data cited by RBC Capital Markets. So in 2009, the government decided to curtail the chaos and huge financial losses by signing an amnesty agreement and pledging to provide monthly cash payments and vocational training programs to the nearly 30,000 former militants in exchange for cooperation. S ome of the more influential members like Tompolo — who at one point topped Nigeria’s “most wanted” list — received some lucrative security contracts worth nearly $100 million per year. The arrangement was a pretty good band-aid. However, it failed to address the fundamental drivers of instability in the region such as poverty, corruption, and the proliferation of weapons. who had received the largest payoffs from the government have been directly implicated,” wrote Croft. And now, Nigeria’s new government has been axing expensive security contracts and issuing indictments for theft, fraud, and money laundering. “The government appears to be on course fo a head on collision with armed militants in the oil region,” Croft wrote, echoing comments she made in January . The bigger picture here is that this “collision” could destabilize Nigeria’s oil production in the long term. Already, about 15% of Nigeria’s crude output is offline, according to data cited by RBC Capital Markets. And the team believes this number could double in the coming months. Plus, even if the militants don’t target the facilities, there are several key pipelines at risk as well. “Nigerian production has been slowly grinding lower over recent years, even absent acute outages due to natural declines, and this will be compounded over the next several years given the number of shelved projects,” Croft wrote as a closing statement.